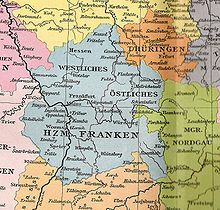 Franconian (Dutch: Frankisch; Afrikaans: Frankies; German: Fränkisch) includes a number of West Germanic languages and dialects possibly derived from the languages and dialects originally spoken by the Franks from their ethnogenesis in the 3rd century AD. A famous likely speaker was Emperor Charlemagne. Linguists have different views about whether these languages and dialects have descended from a single Franconian proto-language, also known as Istvaeonic. The Franconian languages and dialects consist of three main groups. The first is the Low Franconian branch, which consists of Dutch and Afrikaans as well as of several Low Franconian dialects spoken in the Netherlands and Belgium, where they are considered as dialects of Dutch and Limburgish, and in Germany, where they are considered as dialects of German. The second group are the Central- and Rhine Franconian dialects. These Central German dialects are considered as dialects of German in Germany and Belgium, as Luxembourgish in Luxembourg, as Lorraine Franconian in France, and as Kerkraads in the Netherlands. The southernmost group of Franconian dialects are the High Franconian dialects, consisting of the South- and East Franconian dialects. South Franconian is mainly spoken in Germany, but also in France, whereas East Franconian is only spoken in Germany. The High Franconian dialects are considered as dialects of German in Germany, and as Alsatian in France. They are transitional dialects between Central- and Upper German. Because they are spoken in the region of Franconia, the East Franconian dialects are the only ones colloquially referred to as "Franconian" by their speakers. 3 Historical views of the linguistic concept and meaning of "Franconian"
Low Franconian dialect area in the Netherlands, Belgium, Germany, and France. Low Franconian, also called Low Frankish, consists of Dutch, Afrikaans, Limburgish, and their dialects, some of which are sometimes seen as regional languages. They are spoken in the Netherlands, Belgium, South Africa, Namibia, the western tip of Germany (in the West German Lower Rhine region, former Duchy of Cleves), the northern tip of France (Westhoek), Suriname, and parts of the Caribbean, as well as in communities in the United States, Canada, Australia and New Zealand. With a total of over 40 million speakers this is the most numerous of the three groups, as well as most spread globally and the only group that has members which are official, national and standard languages. Sometimes, Low Franconian is grouped together with Low German rather confusingly as "Low German". However, since this grouping is not based on common linguistic innovations, but rather on the absence of the High German consonant shift and Anglo-Frisian features, modern scholars prefer not to group them together. A transitional zone between Low Franconian and Central Franconian is formed by the so-called Meuse-Rhenish dialects (e.g. Low Dietsch, Bergish, and East Bergish) located in southern Dutch Limburg and in the German Lower Rhine (German: Niederrhein). South Guelderish, spoken in Gelderland and the adjacent areas in the German state of North Rhine-Westphalia (Kleverländisch, example: Duisburg Platt), including East Bergish, part of the Meuse-Rhenish transitional dialect group with Ripuarian. Pella Dutch dialect in Pella, Iowa, U.S. The Franconian dialects of Vogtland, the easternmost Franconian-speaking region. The High Franconian dialects consist of the East- and South Franconian dialects. These dialects are transitional dialects between Central- and Upper German, and are spoken by an estimated 2,500,000 people. The East Franconian dialect branch is one of the most spoken dialect branches in Germany. These dialects are mainly spoken in the region of Franconia. Franconia consists of the Bavarian districts of Upper-, Middle-, and Lower Franconia, the region of South Thuringia (Thuringia), and the eastern parts of the region of Heilbronn-Franken (Tauber Franconia and Hohenlohe) in Baden-Württemberg. The easternmost Franconian-speaking areas are the Saxon parts of Vogtland, in whose central parts East Franconian (Core Vogtlandian), and in whose eastern parts transitional dialects (North Vogtlandian and Southeast Vogtlandian) are spoken. The East Franconian dialects are the only Franconian dialects that are referred to as "Franconian" by their speakers. Only the speakers in Saxon Vogtland refer to their dialects as "Vogtlandian" rather than "Franconian". The largest cities in the East Franconian dialect area are Nuremberg and Würzburg. South Franconian is mainly spoken in northern Baden-Württemberg in Germany, but also in the northeasternmost part of the region of Alsace in France. While these dialects are considered as dialects of German in Baden-Württemberg, they are considered as dialects of Alsatian in Alsace (the other Alsatian dialects are either Alemannic or Rhine Franconian). The South Franconian dialects are colloquially referred to by their speakers as "Badian" in the Badian parts, and as "Unterländisch" (the Unterland being the region around Heilbronn) or "Swabian" (because of strong influences from the capital Stuttgart, where Swabian dialects are spoken) in the Württembergian parts of Baden-Württemberg. The largest cities in the South Franconian dialect area are Karlsruhe and Heilbronn. As it applies to modern languages, Franconian is somewhat variable in meaning. It can refer to a West Germanic dialect continuum spoken in the Rhineland, including Dutch at one end and all the transitional dialects between Dutch and standard German, including it, which do not fully participate in the High German consonant shift or German diphthongization of long vowels. This area follows the course of the Benrath and Speyer lines, a zone along which the two changes occurred along with other diagnostic changes. From a linguistics point of view the Rhineland is an intermediate zone where the Rhenish Fan is located, a zone where eight isoglosses converge. Not all Dutch dialects are contained in the Rhineland; moreover, historical Franconian, which comprises other aspects of the language of the Franks, was spoken also in the lowlands. Dutch is spoken between the Rhineland and the North Sea. A second definition extends the range of Franconian to include the lowlands to the west, to the east all the way to Bamberg in East Franconia, and to the south as far as, and including, Alsace, far from the Rhineland. In all, in this definition, the Franconian language area consists of the Low Countries (Netherlands, Belgium, Luxembourg), parts of France (e.g. the Dunkirk district and half of Lorraine), and West-Central Germany (around Aachen, Cologne and Trier), as well as all of the former Franconia. In addition to these continental dialects, Franconian includes two overseas dialects: Afrikaans spoken in South Africa and the Pennsylvania German language spoken in North America. The difference between a dialect and a language is often debatable. In general, a dialect is contained within a language, and is not identical to it, unless the language has only that dialect. The Franconian languages are considered dialects of German and Dutch even though often termed languages. The dialects are further subdivided into ranges under a common name, which may also be subdivided; for example, Flemish is a dialect of Dutch. It is further divided into East and West Flemish. Not all dialects of Dutch and German are Franconian. For example, in the case of German, excluded from the category "Franconian" are the high, or "Alpine," dialects of Swabia, Bavaria, Austria and Switzerland, as well as the various dialects of Low German. The word "Franconian" refers to a collection of dialects, and not to a language. Languages have to be genetically related, unless they are defined as isolates; that is, a parent language descends into child languages, or reflex languages, which are defined on that account to be "related." Dialects are not necessarily related. For example, German and Dutch, which are closely related, descend from Proto-Germanic, a parent language. Dialects of German and Dutch at any stage of their development are not necessarily related to each other. The defining elements of the dialect might come from any language or be innovated. No dialect labelled "Franconian" has to be related to any other dialect of the same tag. For example, Old Low Franconian, ancestral phase of Dutch, is not related to the Franconian dialects of Old High German. Moreover, Middle Franconian is not related to Middle High German. Historical views of the linguistic concept and meaning of "Franconian"
"Franconian" is an English word. Continental Europeans use the equivalent of "Frankish", from the original Latin Franci, with the same meaning; for example, the German for Old Franconian is alt-Fränkisch. The Dutch linguist, Jan van Vliet (1622-1666), uses Francica or Francks to mean the language of the oude Francken ("Old Franks"). According to van Vliet, Francks descended from oud Teuts, what is today referred to in English as the Proto-Germanic language. The name "Franconian", an English adjective made into a noun, comes from the official Latin name of an area (and later stem duchy) in the Middle Ages known as Franconia (German: Franken). If being in the territory of the original Franci is a criterion of being Frankish, it was not originally Frankish, but Alemannic, as the large Roman base at Mainz, near the confluence of the Main and the Rhine, kept the Franci and the Suebi, core tribe of the Alemanni, apart. When the Romans withdrew, the fort became a major base of the Ripuarian Franks, who promptly moved up the Main, founded Frankfurt ("the ford of the Franks"), established a government over the Suebi between the Rhine and the Danube, and proceeded to assimilate them to all things Frankish, including the dialects. The Ripuarian Franks at that time were not acting as such, but were simply part of the Frankish empire under the Carolingian dynasty. Franconian is the only English single word describing the region called Franken by the Germans. The population considered as native is also called Franken, who speak a language called Fränkisch, which are dialects included in German. In the Middle Ages, before German prevailed officially over Latin, the Latinizations, Franconia and Francones, were used in official documents. Since Latin was the scholarly lingua franca, the Latin forms spread to Britain as well as to other nations. English speakers had no reason to convert to Franken; moreover, "Frankish" was already being used for French and Dutch. Franconian was kept. The language of the Germans is High Dutch, of which there are many dialects, so different, that the people of one province scarce understand those of another. In the mid-19th century, a time when the Germans were attempting to define a standard German, the term alt-Fränkisch made its appearance, which was an adjective meaning "old-fashioned." It came into English immediately as "Old Franconian." English writings mentioned Old Franconian towns, songs and people, among other things. To the linguists, the term was a windfall, as it enabled them to distinguish a Stammsprach. For example, in 1863 Gustave Solling's Diutiska identified the Pledge of Charles the Bald, which is in Old High German, as Old Franconian. He further explains that the latter is an Upper German dialect. By the end of the century the linguists understood that between "Low Dutch" and "High Dutch" was a partially altered continuum, which they called Middle, or Central, German. It had been grouped with Upper, or High, German. This "Middle" was between low and high, as opposed to the Chronological Middle High German, between old and new. In 1890 Ernest Adams defined Old Franconian as an Old High German dialect spoken on the middle and upper Rhine; i.e., it went beyond the limits of Franconia to comprise also the dialect continuum of the Rhineland. His earlier editions, such as the 1858, did not feature any Old Franconian. After the English concept of Franconian had expanded to encompass the Rhineland in the 1850s and 1860s, a paradox seemed to prevent it from spreading to the lower Rhine. Language there could not be defined as High German in any way. In 1862 Max Müller pointed out that Jacob Grimm had applied the concept of "German" grammar to ten languages, which "all appear to have once been one and the same." One of these was the "Netherland Language, which appears to have been produced by the combined action of the older Franconian and Saxon, and stands therefore in close relation to the Low German and the Friesian. Its descendants now are the Flemish in Belgium and Dutch in Holland [sic]." Müller, after describing Grimm's innovation of the old, middle and new phases of High German, contradicts himself by reiterating that Franconian was a dialect of the upper Rhine. After somewhat over a generation a formal solution had been universally accepted: Franconian had a low phase. An 1886 work by Strong and Meyer defined Low Franconian as the language "spoken on the lower Rhine." Their presentation included an Upper, Middle and Lower Franconian, essentially the modern scheme. Low Franconian, however, introduced another conflict of concepts, as Low Franconian must mean, at least in part, Dutch. Here Strong and Meyer are anachronistic on behalf of consistency, an error that would not have been made by native Dutch or German speakers. According to them, "Franconian ceases to be applied to this language; it is then called Netherlandish (Dutch)...." Only the English ever applied Franconian anywhere; moreover, Netherlandish had been in use since the 17th century, after which Dutch was an entirely English word. The error had been corrected by the time of Wright's An Old High-German Primer two years later, in 1888. Wright identifies Old Low Franconian with Old Dutch, both terms used only in English. Before it acquired the present name "Germanic", "Germanic" was known as "Teutonic". The Germanics were literary witnesses in history to the alteration of their early Germanic speech into multiple languages. The early speech then became Old Teutonic. However, this Old Teutonic remained out of view, prior to the earliest writings, except for the language of the runic inscriptions, which, being one or two words and numbering less than a thousand, are an insufficient sample to verify any but a few phonetic details of the reconstructed proto-language. Van Vliet and his 17th century contemporaries inherited the name and the concept "Teutonic". Teutones and Teutoni are names from classical Latin referring to the entire population of Germanics in the Proto-Germanic era, although there were tribes specifically called Teutons. Between "Old Dutch" (meaning the earliest Dutch language) and "Old Teutonic", Van Vliet inserted "Frankish", the language of the Old Franks. He was unintentionally ambiguous about who these "Old Franks" were linguistically. At one point in his writing they were referred to as "Old High German" speakers, at another, "Old Dutch" speakers, and at another "Old French" speakers. Moreover, he hypothesized at one point that Frankish was a reflection of Gothic. The language of the literary fragments available to him was not clearly identified. Van Vliet was searching for a group he thought of as the "Old Franks", which to him included everyone from Mainz to the mouth of the Rhine. By the end of the 17th century the concept of Old Frankish, the ancestor language of Dutch, German, and the Frankish words in Old French had been firmly established. After the death of Junius, a contemporary of Van Vliet, Johann Georg Graevius said of him in 1694 that he collected fragments of vetere Francica, "Old Frankish," ad illustrandam linguam patriam, "for the elucidation of the mother tongue." The concept of the Dutch vetere Francica, a language spoken by the Franks mentioned in Gregory of Tours and of the Carolingian Dynasty, which at one end of its spectrum became Old Dutch, and at the other, Old High German, threw a shadow into neighboring England, even though the word "Franconian", covering the same material, was already firmly in use there. The term "Old Frankish" in English is vague and analogous, referring either to language or to other aspects of culture. In the most general sense, "old" means "not the present", and "Frankish" means anything claimed to be related to the Franks from any time period. The term "Old Frankish" has been used of manners, architecture, style, custom, government, writing and other aspects of culture, with little consistency. In a recent history of the Germanic people, Ozment used it to mean the Carolingian and all preceding governments and states calling themselves Franks through the death of the last admittedly Frankish king, Conrad I of Germany, in 919, and his replacement by a Saxon. This "Old Frankish" period, then, beginning in the Proto-Germanic period and lasting until the 10th century, is meant to include Old High German, Old Dutch and the language that split to form Low German and High German. Germanic is so diverse as to defy attempts to arrive at a uniform Germanic ancestor. Max Müller finally wrote in the lectures on the Science of Language, under the heading, "No Proto-Teutonic Language:"
"We must not suppose that before that time [7th century] there was one common Teutonic language spoken by all German tribes and that it afterwards diverged into two streams — the High and the Low. There never was a common, uniform Teutonic language; .... This is a mere creation of grammarians who cannot understand a multiplicity of dialects without a common type." Historical linguistics did not validate his rejection of the Tree model, but it did apply the Wave model to explain the diversity. Features can cross language borders in a wave to impart characteristics not explicable by descent from the language's ancestor. The linguists of the early 19th century, including Müller, had already foreshadowed the Wave Model with a concept of the "blend" of languages, of which they made such frequent use in the case of Germanic that it was difficult to discern any unblended language. These hypothetical "pure" languages were about as inaccessible as the Proto-Germanic Old Frankish; that is, pure guesswork. Dialects or languages in the sense of dialects became the major feature of the Germanic linguistic landscape. A second term in use by Van Vliet was oud Duijts, "Old Dutch", where Duijts meant "the entire Continental Germanic continuum". The terms Nederlandsch and Nederduijts were coming into use for contemporary Dutch. Van Vliet used the oud Duijts ambiguously to mean sometimes Francks, sometimes Old Dutch, and sometimes Middle Dutch, perhaps because the terms were not yet firm in his mind. Duijts had been in general use until about 1580 to refer to the Dutch language, but subsequently was replaced by Nederduytsch. English linguists lost no time in bringing Van Vliet's oud Duijts into English as "Old Dutch". The linguistic noun "Old Dutch", however, competed with the adjective "Old Dutch", meaning an earlier writing in the same Dutch, such as an old Dutch rhyme, or an old Dutch proverb. For example, Brandt's "old Dutch proverb", in the English of his translator, John Childe, mentioned in 1721: Eendracht maekt macht, en twist verquist, "Unity gives strength, and Discord weakness," means contemporary Dutch and not Old Dutch. On the frontispiece, Childe refers to the language in which the book was written as "the original Low Dutch". Linguistic "Old Dutch" had already become "Low Dutch", the contemporary language, and "High Dutch", or High German. On the other hand, "Old Dutch" was a popular English adjective used in the 18th century with reference to people, places and things. ^ The total of speakers of all Low Franconian dialects and languages, based on Ethnologue gives a number of over 40 million speakers: 22 million Dutch speakers, 16 million Afrikaans speakers and the various dialects of these 2 languages (Flemish for example, has one million speakers) creates a number around, and probably over 40 million speakers. ^ Welschen, Ad : Course Dutch Society and Culture, International School for Humanities and Social Studies ISHSS, Universiteit van Amsterdam 2000-2005. ^ When taking all West Central German dialects as listed by Ethnologue the number 15.350,000 appears, 2 dialects have no speaker data, however considering the area in which they are spoken and the demographics of the area as well as comparable dialects an estimate of about 4,000,000 can be made. ^ Harbert, Wayne Eugene (2007). The Germanic Languages. Cambridge Language Surveys. Cambridge / New York: Cambridge University Press. pp. 15–17. ^ "Franconian". Webster's Third New International Dictionary and Seven Language Dictionary. Volume I: A to G. Chicago et al. : Encyclopædia Britannica, Inc. 1986. ^ a b Green, D. H.; Siegmund, Frank (2003). The continental Saxons from the migration period to the tenth century: an ethnographic perspective. Studies in Historical Archaeoethnology. 6. Suffolk: Center for Interdisciplinary Research on Social Stress / Woodbridge. p. 19. There has never been such a thing as one Frankish language. The Franks spoke different languages. ^ Dekker 1998, pp. 245–247. ^ Salmon, Thomas (1767). A New Geographical and Historical Grammar: Wherein the geographical part is truly modern; and the present state of the several kingdoms of the world is so interspersed, as to render the study of geography both entertaining and instructive (new ed.). Edinburgh: Sands, Murray, and Cochran, for J. Meuros. p. 147. ^ Bethel, Slingsby (1681). The Interest of the Princes and States of Europe (2nd ed.). London: J.M. for John Wickins. pp. 152–153. ^ Solling, Gustav (1863). Diutiska: An Historical and Critical Survey of the Literature of Germany, from the Earliest Period to the Death of Göthe. London: Tübner. pp. 14–16. ^ Adams, Ernest (1890). The elements of the English language. London: George Bell and Sons. p. 17. ^ Vaughan, Robert; Allon, Henry (July 1, 1862). "The Science of Language". British Quarterly Review. 36 (71): 218–220. In this review Vaughan and Allon are paraphrasing from Max Müller's Science of Language lecture series, German language, later translated and published in English. ^ Strong, Herbert Augustus; Meyer, Kuno (1886). Outline of a History of the German language. London: Swan Sonnenschein, Le Bas & Lowrey. p. 68. ^ Wright, Joseph (1888). An Old High-German Primer. Oxford: Clarendon Press. p. 1. ^ Ozment, Steven (2005). A Mighty Fortress: A New History of the German People. New York: HarperCollins. p. 49. ^ Müller, F Max (1899) . The Science of Language, Founded on Lectures Delivered at the Royal Institution in 1861 and 1863. New York: C. Scribner's Sons. pp. 247–248. ^ Dekker 1998, pp. 255–256. ^ Brandt, Gerard; Childe, John (Translator) (1721). The history of the Reformation and other ecclesiastical transactions in and about the Low-countries: from the beginning of the eighth century, down to the famous Synod of Dort, inclusive. In which all the revolutions that happen'd in church and state, on account of the divisions between the Protestants and Papists, the Arminians and Calvinists, are fairly and fully represented. Vol II. London: T. Wood. p. 346. Dekker, Cornelis (1998). The origins of Old Germanic studies in the Low Countries. Studies in Intellectual History. 92. Leiden: Brill. Feulner, Hans-Jürgen; Wunder, Bernhard; Bittruf, Doris; Grebner, Stefan (1997). Wie såchd denn Ihr dezu? : Ein fränkisches Mundart-Wörterbuch für den Landkreis Kronach. Schirmer Druck, Mitwitz. ISBN 3-9803467-3-0. Munske, Horst Haider; Hinderling, Robert (1996). "Linguistic Atlas of Bavaria-Swabia", "Linguistic Atlas of Middle Franconia", "Linguistic Atlas of Lower Franconia", "Linguistic Atlas of North East Bavaria", "Linguistic Atlas of Lower and Upper Bavaria". Bavarian Linguistic Atlas. Heidelberg: University Press. ISBN 3-8260-1865-6. Munske, Horst Haider; Klepsch, Alfred (2004) . Linguistic Atlas of Middle Franconia. Heidelberg: University Press. van der Horst, J. M. (2002). Introduction to Old Dutch. University Press, Leuven. Wells, Chris (1985). German: A Linguistic History to 1945. Oxford: Clarendon Press. Low Franconian/Low Frankish are a group of several West Germanic languages spoken in the Netherlands, northern Belgium (Flanders), in the Nord department of France, in western Germany, as well as in Suriname, South Africa and Namibia that originally descended from the Frankish language. Ripuarian is a German dialect group, part of the West Central German language group. Together with the Moselle Franconian which includes the Luxembourgish language, Ripuarian belongs to the larger Central Franconian dialect family and also to the Rhinelandic linguistic continuum with the Low Franconian languages. The Indo-European languages include some 449 languages and dialects spoken by about or more than three billion and 500 million people. Most of the major languages belonging to language branches and groups of Europe, and Western and southern Asia, belong to the Indo-European language family. Therefore, Indo-European is the biggest language family in the world by number of mother tongue speakers. Eight of the top ten biggest languages, by number of native speakers, are Indo-European. One of these languages, English, is the De facto World Lingua Franca with an estimate of over one billion second language speakers. East Franconian, usually referred to as Franconian in German, is a dialect which is spoken in Franconia, the northern part of the federal state of Bavaria and other areas in Germany around Nuremberg, Bamberg, Coburg, Würzburg, Hof, Bayreuth, Meiningen, Bad Mergentheim, and Crailsheim. The major subgroups are Unterostfränkisch, Oberostfränkisch and Südostfränkisch. In linguistics, Old Dutch or Old Low Franconian is the set of Franconian dialects spoken in the Low Countries during the Early Middle Ages, from around the 5th to the 12th century. Old Dutch is mostly recorded on fragmentary relics, and words have been reconstructed from Middle Dutch and Old Dutch loanwords in French. Meuse-Rhenish is a modern term that refers to the literature written in the Middle Ages in the greater Meuse-Rhine area. This area stretches in the northern triangle roughly between the rivers Meuse and Rhine. It also applies to the Low Franconian dialects that have been spoken in that area in continuation from mediaeval times up to now. Weser-Rhine Germanic is a term introduced by the German linguist Friedrich Maurer for the group of prehistoric West Germanic dialects ancestral to Low Franconian and Rhine Franconian, and ultimately to Dutch and the West Central German dialects. It is a replacement for the older term Istvaeonic, with which it is essentially synonymous. The term Rhine-Weser-Germanic is sometimes preferred. The name of the Franks and the derived names of Francia and Franconia are derived from the name given to a Germanic tribal confederation which emerged in the 3rd century.